Punk trio Coady and the Creepies are determined to become the greatest band that’s ever lived. There’s only one problem...their lead singer is technically...dead? Punk’s Not Dead! ...but Coady is. 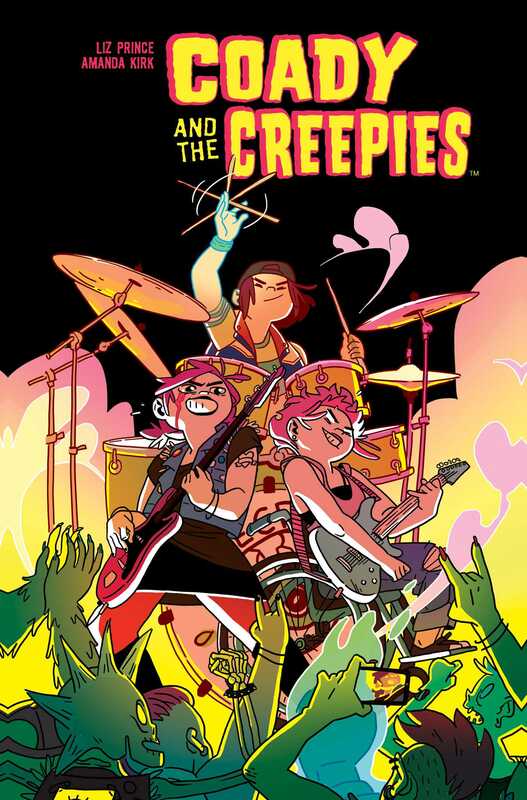 Sisters and bandmates Coady, Corey, and Criss are The Creepies, a trio of punk rockers determined to become the greatest band that’s ever lived. But that’s kinda tough when one of them is technically dead. As The Creepies, they’re heading out on their first tour since a freak accident left Coady eerily unscathed...fighting their way through blood-sucking promoters, fanboy zombies and ghoulish rival bands to achieve their dream. There’s only one problem...it’s hard to be the greatest band that ever lived when your drummer is...a ghost? From zine queens Liz Prince (Tomboy, Will You Still Love Me If I Wet the Bed?) and Amanda Kirk (Nation of Amanda) comes a spooky comedy about the power of music, family and following your bliss.